Announcement Holiday Shipping Info: Please order by December 20th for USPS 1st class shipping by December 25th within the contiguous US. Orders may take up to 3 business days to process during this busy time of year. HAPPY HOLIDAYS & THANK YOU for shopping GyspyWearsShop! 20% OFF + FREE Shipping on entire Etsy Shop #SmallBusinessSaturday through #CyberMonday! Happy Holidays!! Holiday Shipping Info: Please order by December 20th for USPS 1st class shipping by December 25th within the contiguous US. Orders may take up to 3 business days to process during this busy time of year. HAPPY HOLIDAYS & THANK YOU for shopping GyspyWearsShop! Love the bar buddy! It makes my barre classes more comfortable. Also, very well made. Thank you for making these available. Post shoot with our mascot wearing his own Bun Buddy! I am a lifelong dancer and lover of multifunctional creations. I started GypsyWears with an idea for the ballet barre. I was tired of the dirty, hard, sometimes splintered, ballet barres and invented a cushioned cover with a removal sweat towel--the Barre Buddy. It took me 5 years to get my US patent for it. It is easy to take to the studio and I love it most during stretch at the barre! Next, I created a hair wrap for buns to keep my mop of curly hair out of my face during ballet or yoga. The Bun Buddy not only keeps a bun in place with its snap system, but it can be worn so many ways! I like to wear it as a neck warmer, headband, ear warmer, and even an eye cover while traveling. The possibilities are endless! My latest creations and designs have been around warm ups and athleisure--things I could wear from the ballet or yoga studios to the streets. I love the versatility of the Multi Wrap and often wear it in class as a sort of dance dress. It also makes a great beach cover up. The Shrug Wrap is soft & warm and is fun to style. And, finally, the Zip Wrap has a super soft micro terry inside that wicks away sweat and covers the bum for running out to the market after class. I so enjoy creating all of these designs out of my own necessity and I hope you will enjoy them, too! Thank you so much for stopping by GypsyWearsShop!! A NEW super soft & fun multi-functional accessory that can be fashioned into all sorts of looks! The bun buddy® keeps hair securely away from the face and is good for warmth before, during, and after workouts. It is also great for damp or wet hair from exercise or swimming where it can be worn loose. Doubles as a stylish neck or ear warmer & headband. Wear it all sorts of different ways! • Secures hair into a fun bun in a snap! • Doubles as a neck warmer—great for voice students and singers! • Easy Solution for those bad hair days! • Short hair, no hair—NO problem, wear a bun anyway! Make a Bun: Place bun buddy over head and onto neck with seam and snaps along the back of your neck. Then, bring bun buddy up to your forehead as a headband. Pull bun buddy over your hair covering it as in a tube. Twist bun buddy. When you can twist no more, wind twist into a bun. Pull snap through the center of bun and secure snap at nape of neck. Voila, bun buddy is secure! MORE POSSIBILITIES–WEAR IT YOUR WAY! Neck Warmer: Place bun buddy over your head onto your neck with seam in the back.Voila, a cute & stylish neck warmer or accessory! Scarf: Place bun buddy over head and down around neck with seam in back.Pull up in front to cover face for warmth. Mock Scarf: Wrap bun buddy tube around neck as a traditional scarf (can cross and snap if desired. )Place under jacket or other garment. Ear Warmer: Place bun buddy over your head with seam in back.Once around your neck, bring it up around your forehead, top of head, and ears.Voila, toasty warm ears and head! Headband: Squish bun buddy into a loop and place it around your forehead & back of hair with seam in back. Headband Tied (Lo): Fold bun buddy into thirds lengthwise and wrap around forehead and base of neck.With ends at base of neck, tie bun buddy (like 1st step of tying a bow) and then snap. Headband Tied (Hi): Fold bun buddy into thirds lengthwise and wrap under neck.With ends at top of head, tie bun buddy (like 1st step of tying a bow) and then Snap.Voila, cute stylish headband! Hang Loose: Place bun buddy over your head with the seam in back. Then, bring bun buddy up to your forehead as a headband. Pull bun buddy over & around your hair as in a tube.Voila, head and hair cover great for wet or damp hair after workout or swimming! Hang Tight: Place bun buddy over your head with the seam in back. Then, bring bun buddy up to your forehead as a headband. Pull bun buddy over & around your hair as in a tube. Last, wrap tube around front of neck and snap closure around back of neck. Voila, warm head, warm neck! Unique for a performance too! All Over: Place bun buddy over head and down around neck.Pull back of bun buddy over back of head and over forehead. Knot Long: Make a knot approximately a 1/4 of the way down on the bun buddy. Place small cap end on head. Beanie Cap: Take bun buddy inside out & make a full, complete twist in the center. Hold twist securely & double one side of bun buddy over the other. Voila, a beanie cap that can be worn for warmth & style! Knot Cap: Turn bun buddy inside out. Place both arms crossed inside bun buddy and grab each end. Pull your arms out making a knot in the bun buddy. Make the opening into the size to fit over your head & adjust knot. Mock Skirt: Wrap flat tube around waist & hips and snap in the back or on the side. Belt: Squish bun buddy lengthwise and then wrap around waist and snap. Have you created a new way to wear your bun buddy®? Tell us! A handy dance accessory for comfort & cushion at the ballet barre. 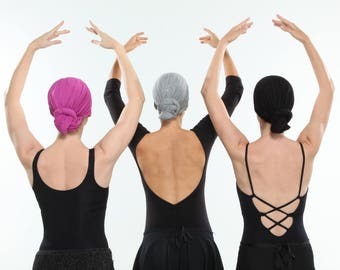 The soft, absorbent barre buddy quickly & easily secures around the barre to provide much-needed extra padding and protection against germs, blisters, splinters, calluses, chafing, and adds a dash of style and fun to the conventional, hard and often grimy ballet barre. It has quick & easily adjustable closures and an effortlessly removable sweat towel. Also, the barre buddy comes in its own mesh bag for carrying to class and washing. • Clean & Sanitary—No more perspiration, germs, and grime from hands & feet on the barre! • Includes machine washable laundry bag that may be tied to the barre. Great for ballet delicates too! • For studio owners—ensures less wear & tear on your ballet barres! Demi barre buddy®: Lay the barre buddy centered on the ballet barre lengthwise with the towel on your left. Attach the Velcro closures underneath the barre at each end securely and voila you are ready to begin class! Grande barre buddy®: Lay the barre buddy centered on the barre lengthwise with sweat towel on your left. Attach the 3 pairs of Velcro closures at both ends and in the middle underneath the barre. Voila, ready for class! Detach the closures at the middle and at the end opposite the towel. Move that farthest end completely underneath the barre buddy and attach Velcro closure underneath. This closure will now be under the end with the towel. Last reattach the middle Velcro closure—the middle has now become the new end closure. Fabric & care: 100% cotton woven terry velour. Machine washable. ATTACH Velcro pairs before washing & when not in use. Also can wash sweat towel separately. Machine wash warm in laundry bag provided and tumble dry warm. Remove promptly. Do not bleach. One size fits most standard ballet barres. My production partner helps sew my designs.